[PHIL] It's been great travelling with Bianca; she will eat any food, mime any illness at the chemist, join in with any fake tourist dancing and add to the mix her bum dance and get her hellos and thankyous mixed up in any language (e.g. "gosh this local 'mystery meat' dish looks wonderful! Hello."). It's also been great buying things for our nest in the Blue Mountains and talking about our future together. [BIANCA] At the edge of a sacred lake, one day's walk from Everest, lying in the sun in nice-smelling dwarf rhododendrons, Phil asked me to marry him. It's hard to put into words how happy I was feeling BEFORE he popped the question, so you can imagine that my emotions got a little out of hand when he asked. Our companions had gone for a long walk around the lake so we had a couple of blissful hours cuddling in the sun, and then huddled under wet weather gear when it snowed. 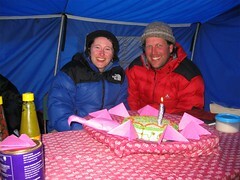 Phil said he had originally intended to propose at east face Base Camp, but unforeseen factors such as landslides and yak-unfriendly scree slopes meant our trek plans had changed. 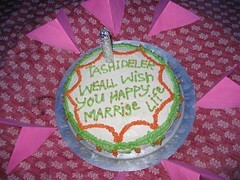 After we returned to our nearby camp and told our Tibetan and Nepali crew, our AMAZING camp cook Ngawang managed to whip up a fabulous engagement cake, complete with detailed icing writing, with only 2 hours warning. This is despite being 5 days into our trek in the wilderness, 4500m above sea level and equipped only with camping cooking equipment. Damn good cake it was, too!And they gave us a card signed by the whole group and gave us a ceremonial white silk scarf. Luckily there was one piece of cake left over which we gave to the gods at the top of Langma La pass (shortly before getting lost in waist deep snow for half a day! ).We had to wait 10 days to tell family and friends because we were so far from civilisation but now the word is out. 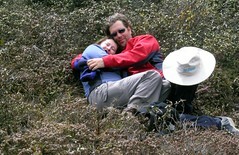 No details on dates or all that stuff - we're just enjoying being back in Kathmandu with clean clothes and hot showers. No more do we smell like yak butter and yak dung smoke. Love those yaks but gosh they're whiffy. And so it is that the best thing to ever come into my life is going to be there for the rest of it. For once, words actually fail me in trying to describe why I love Phil so much, but being with him is like having all those pieces of the jigsaw puzzle that I didn't know were even missing suddenly fall into place. I've already said it, but I wanted to leave a comment, as no-one else seems to! We (Dean and I) are so pleased for you both - it makes us teary-eyed! We can't wait to see you - March is too long! I thought the big news was going to be that Bianca was pregnant! I suppose I'll have to wait for that one! Heya! Awwwww.... shucks. Can't wait to see you two too, and knock back some grand Hunter reds in celebration. You'll just have to wait a bit for patter of tiny feet - not ready to give up the vino just yet! lv and hugs. What fantastic news, a perfect match huh! Hey Phil, you'll be pleased to know that Andrew is totally focussed and he's letting nothing stand in the way of Catch's progress. Bianca, we miss you on New Scientist please make sure you come home. Made me smile loads. Call me when you land in London, I can't wait to see you two.